Click the button below to add the Mimaki JFX-1615 Head FPCP1.0-20-420MM - E300776 to your wish list. 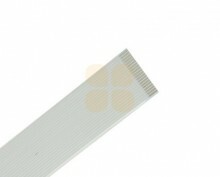 This data cable is suitable for Mimaki JFX series printers. This is the original Mimaki part (number E300776 replacing number E300607). This flat cable is 42.8cm long, 2.1cm wide and has 20 pins.